What Type of Bread Is Used for Different Types of Sandwiches? When it's lunchtime, the sandwich is king. 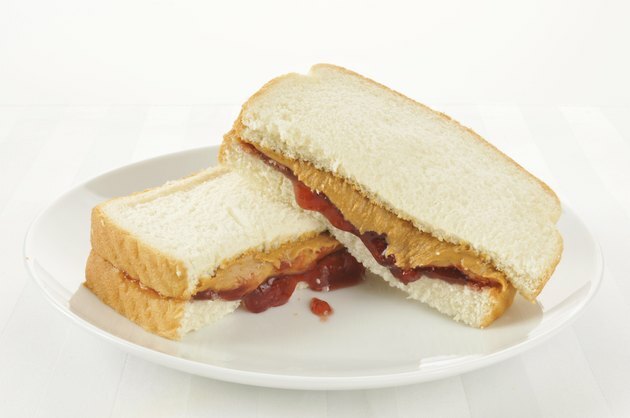 The lunch staple dates back to the 1700s, when the Earl of Sandwich, a notorious gambler, asked for meat placed between two slices of bread so he could eat and gamble concurrently. The craze caught on as other gamblers ordered the same, and a lunchbox addition was born. Although a traditional sandwich may seem a bit boring, changing the types of bread and fillings can yield a different flavor and texture that allows the sandwich to be a versatile food. When you head to the grocery store, chances are that you make a beeline for the bakery. There, you'll find rows of bagged sandwich bread. White and whole wheat bread varieties have a mild flavor, which make them best for mild fillings such as meat, vegetables and various butters. Unfortunately, white bread has been stripped of the whole wheat nutrients, so when in doubt, reach for the whole wheat variety. Two slices of whole wheat bread offers 3.6 g protein and 1.9 g fiber as opposed to white bread, which has only 1.9 g of protein and 0.6 g of fiber. Traditional bread is made with yeast, which causes the texture to be light and airy. Yeast bread is a traditionally a Western culture item. In Middle Eastern cultures, bread is made unleavened so it does not rise. The result is chewy, dense types of bread such as pita and naan. Ideal for making wraps and stuffed pockets, unleavened breads typically have fewer carbohydrates than leavened breads, so they're a good choice when you're watching your daily carb intake. Breads such as rye, pumpernickel and sourdough have distinct flavors that can often be acquired tastes. These breads are often sold as specialty items in bakeries and grocery stores. Because the flavor is often strong, they make the best sandwiches when paired with flavorful fillings, such as pastrami and strong cheese. Two slices of rye bread have 83 calories, 2 g of fiber and 3 g of protein, making it a sensible choice come lunchtime. Although sandwiches are often associated with lunchtime, breakfast can be an ideal time for a sandwich as well. Eating a breakfast sandwich made with lean meat and vegetables is a fiber-filled way to start the day and feel full until lunch. Bagels, which are circular and have a center hole, are notorious for being large, so check serving sizes before you eat one as a healthy breakfast. Or make a breakfast sandwich made with egg and lean meat with a whole wheat English muffin for a healthy alternative to fast food fare.